The holy month of Ramzan is coming and I think I should share some Malabar recipes / Iftaar recipes this week. 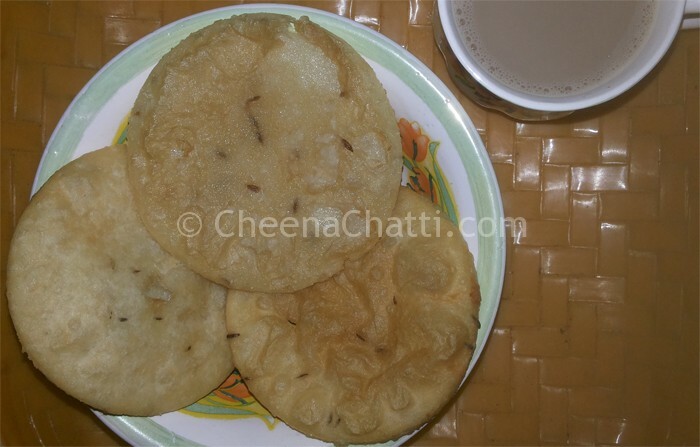 Ney pathiri aka Ney pathal or deep fried rice rotti is a very common breakfast / dinner dish in northern Kerala especially in Kozhikkode and Malabar. In a pan warm 1 tsp ghee and when its hot add water. When the water boils add the flour and warm it for some time in low flame and then turn off the flame. Blend the grated coconut along with cumin seeds and shallots into a coarse form (do not make a paste) in a mixer with a single spin. Add the blended mix to the flour and knead it into a smooth dough similar to pathiri (See the pathiri dough preparation). Roll out small portions of the dough into lime sized ball and flatten it between the palms to give it shape. Using a pathiri press / chappathi press / chapathi roller flatten each balls into thick disc shaped flat breads (with a thickness of 2-3 pooris). Pour coconut oil in a pan and heat it. When it becomes hot drop 1-2 pathiris (depending on the pan size) to the oil. When they start puffing up flip them and fry until they become crispy. Enjoy hot with a cup of tea. Can be served as a breakfast food along with Chicken curry / Fish curry / Mutton curry. You can use All purpose flour / Maida instead of rice flour too. Have you seen other pathiri recipes? This entry was added on June 30th, 2013 by Renoos in Bakery and tagged with breakfast, muslim food recipe, ney pathiri, malabar recipes, iftaar recipes, ramzan recipes, pathiri, nadan snacks, tasty ney pathiri recipes. Last revised on April 4th, 2018. For Neypathal you wrote to use rice powder, but not clear raw rice or boiled rice. In gulf we are getting raw rice powder (Pachari podi) only. Can we use this raw rice powder or we want to insist on boild rice (Puzhunghal ari). @Latheef: We are using raw rice powder for neypathiri preparation. Hi- When in the recipe, do you use the kochulli? @Sun: we will crush the shallots / kohulli along with cumin seeds in step 4. I think for neypathal boiled rice is good, and if we using the rice powder we cannot get correctly , we can use grinder to make neypathal dough. @Praveen: Not sure with boiled rice. At home we always use rice powder.